How to cook lamb just got easy! 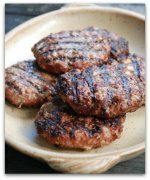 Find great recipes for this delicious meat. Until I learned how to cook lamb properly I absolutely hated its unusual flavor. Raised on beef, chicken and pork, I never tasted lamb until my teens and I swore I’d never eat THAT again. Fast-forward a few years... I start dating this handsome fellow who courts me by preparing lovely meals. Including a leg of lamb on a special occasion. Of course, I ate the lamb and much to my surprise I found it was quite delicious. That same handsome fellow became my husband over 30 years ago and we still eat lamb. The meat of spring lamb is pale pink, tender and mild, almost sweet. Older lamb will appear more brownish-pink. It should not be very red or grey. 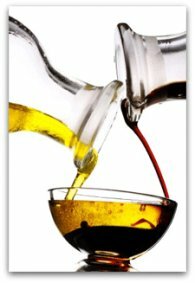 The cheaper and fatter cuts of lamb, those that come from the breast and neck, make great soups, stews and casseroles. You may find this list of cooking times handy. It features the most popular cuts of lamb. And below you'll see that I've made a list of all the cuts and indicated the best way for preparing them. 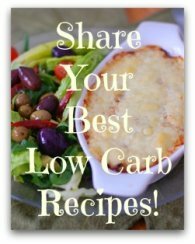 And do check out the low carb lamb recipes I've created for you. Here's one for leftover cooked lamb! 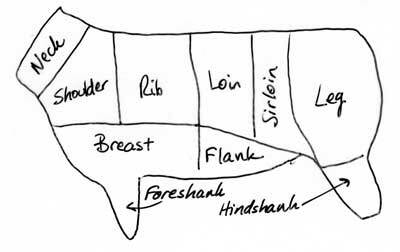 This is a simple lamb cuts diagram to show you where the various cuts come from. So now you'll know how to cook lamb. Here’s a list of lamb cuts (American) and the best way of cooking them. Of course, we’ll soon have some great recipes to go along with some of our favorite cuts of meat. Return to HOME from How To Cook Lamb.